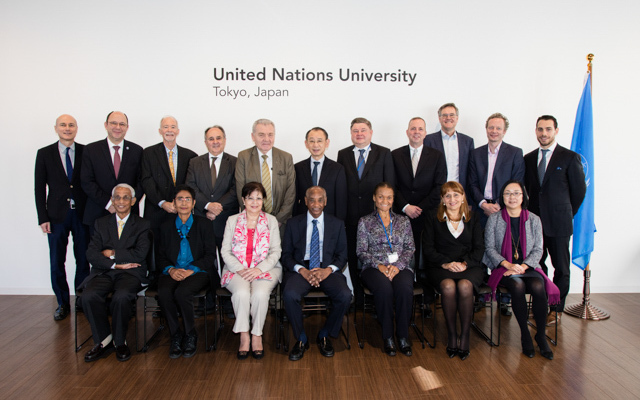 The Council of the United Nations University, which serves as the governing board of the University, held its biannual session on 30 November and 1 December 2015 at UNU Headquarters in Tokyo. At the session, the Council, inter alia, heard and discussed the Rector’s “State of the University” report, reviewed the financial overview of the University, adopted a budget proposal for the 2016–2017 biennium, considered a range of strategic issues, including the progress made to implement the Strategic Plan for 2015–2019, and reviewed reports on and considered general financial and administrative issues, including the operation and activities of UNU institutes, programmes and units. This session was the final meeting for the current class of Council members whose term of office will finish on 2 May 2016. In a closed session, Council members reflected on their six years of Council membership and discussed their conclusions, which will be shared as strategic feedback and recommendations to the new UNU Council which will take office on 3 May 2016. During the two-day session, Council members attended a reception hosted by the Ministry of Foreign Affairs of Japan. The members also met with students from UNU’s postgraduate degree programmes and UNU postdoctoral fellows. After the session, the Council was invited to visit the Nezu Museum. In his remarks at the closing of the session, UNU Rector David M. Malone warmly thanked the retiring Council members for their advice, guidance and support of UNU over the years. Participants included: Prof. Mohamed Hassan (Chair of the Council), Prof. Nobuyasu Abe, Prof. Jean-Pierre Bourguignon, Prof. Rahma Bourqia, Senator Cristovam Buarque, Prof. Gajaraj Dhanarajan, Prof. Zellynne Doloris Jennings-Craig, Prof. Konstantin Khudoley, Ms Lydia Shouleva, Prof. Mala Singh, UNU Rector David M. Malone and three ex-officio members, Mr Thomas Gass representing the UN Secretary-General, Mr Qian Tang representing the UNESCO Director-General and Ms. Mihoko Kumamoto representing the UNITAR Executive Director.